Brand purpose – Navigating towards a substantially better future requires a balanced commitment of long-term vision and strategic decision making. Insights on core branding principles with broad applicability for any marketer, communications professional and business leader – from our Partner Markus Kramer. Views are subjective and our own. July 11th 2017. © Brand Affairs AG. Navigating towards a substantially better future requires a balanced commitment of long-term vision and strategic decision making. In order for a brand to navigate towards a future where it thrives rather than merely survives, finding, articulating and applying a higher purpose is a sine qua non. This paper exposes why purpose is inseparable from future prosperity, and proposes a novel framework rooted in academic rigour and first-hand experience with how executives in charge of brand can create propositions that will thrive in the post-positioning era of total connectedness. Uncertainty about the future is not a new aspect of business life. It may seem more prevalent today than ever, but humanity has always been deeply interested in seeing the future clearly. History, experience and empirical data tell us that the best way to gain a clear picture of the future is to navigate towards it using strategies guided by an overarching purpose. North of strategy, a strongly anchored purpose builds the connective tissue that aligns all stakeholders beyond financial returns. A carefully calibrated and brand-aligned purpose can bridge functions, markets, socio-demographics and much more. 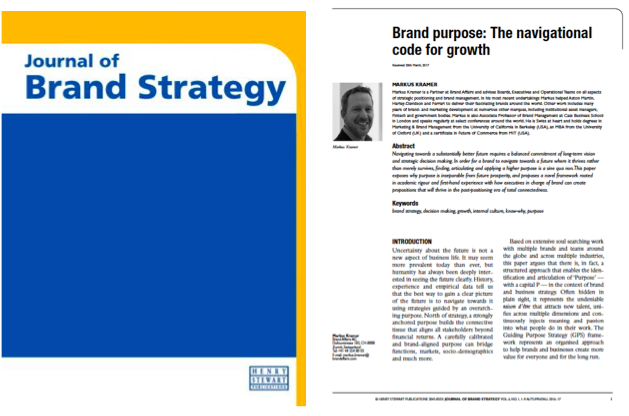 Based on extensive soul searching work with multiple brands and teams around the globe and across multiple industries, this paper argues that there is, in fact, a structured approach that enables the identification and articulation of ‘Purpose’ — with a capital P — in the context of brand and business strategy. Often hidden in plain sight, it represents the undeniable raison d’être that attracts new talent, unifies across multiple dimensions and continuously injects meaning and passion into what people do in their work. The Guiding Purpose Strategy (GPS) framework represents an organised approach to help brands and businesses create more value for everyone and for the long run.